The campaigns offer sharply different interpretations of the facts surrounding the partial government closure last year. Maine’s U.S. Senate race heated up Wednesday as the campaigns of Democrat Shenna Bellows and Republican Sen. Susan Collins sparred over whether Collins deserves credit for ending last year’s government shutdown or blame for helping cause it. The campaigns marked the one-year anniversary of the shutdown with dueling news conferences in which they laid out the same time line of events – and even distributed the same printouts of Senate votes – but offered drastically different interpretations of the facts. Bellows accused Collins of glossing over the fact that she backed Republican budget bills that were clearly doomed in the Democrat-controlled Senate because they would have dismantled President Obama’s landmark health care law. The deadlock led to a 16-day partial shutdown that closed Acadia National Park during peak foliage season, furloughed some Maine shipyard workers and threatened to disrupt benefits payments to millions of veterans. “Mainers won’t forget that when it mattered, when Susan Collins could have shown true leadership by voting against the shutdown in the first place, she didn’t,” Bellows said while standing inside Rising Tide Brewing in Portland. The company was forced to delay shipments of a batch of holiday beer because it could not get government approval for bottle labels. The Collins campaign, in turn, accused Bellows of playing loose with the facts while diminishing Collins’ high-profile role in working toward a bipartisan solution to the shutdown. “The Bellows campaign has had a little bit of a hard time keeping the facts straight on this issue,” retorted Collins spokesman Lance Dutson. The shutdown debate between the well-entrenched incumbent and her energetic challenger is the largest flare-up yet in a campaign that, to date, has been overshadowed by the intense three-way battle for governor. As frequently happens in political campaigns, both sides have been selective about which events they highlight as they recap the shutdown caused by political brinkmanship on both sides. The incident is also a prime example of how the multitude of procedural votes in Congress – the purpose of which is usually lost to all but Washington insiders – often become fodder for attack ads during campaigns. The dust-up began last week when the Collins campaign released a television ad featuring national news coverage of Collins’ leadership of a bipartisan group of senators that put forward a plan to end the shutdown. While the plan ultimately was not adopted, it helped jump start top-level negotiations and served as a framework for the final compromise. “Unfortunately, Susan Collins has not been fully transparent about the votes she took,” Bellows said Wednesday. The Collins camp responded to the Bellows video with a 50-second, cartoonish video of its own which says Bellows got it all wrong. In the votes in question, the campaign said, Collins actually voted against the shutdown by supporting the House Republicans bill to continue funding the government. “Susan Collins voted against killing the budget, thus allowing the budget process to go forward,” Dutson said Wednesday during a news conference held two hours after the Bellows event. Determining which side is correct depends on how one interprets the votes. The votes to which the Bellows video refers – taken on Sept. 30 and Oct. 1 – were focused on whether to remove the language inserted into the budget bill by House Republicans to defund or delay the Affordable Care Act. Collins, who has called for a repeal of the Affordable Care Act, and the 45 other Senate Republicans voted “no” while all 52 Democrats and two independents – including Maine Sen. Angus King – voted “yes” to strip the language from the bill. Likewise, House Republicans rejected Senate Democrats’ “clean” versions of the budget bill. Government offices shut down amid the resulting stalemate. At the time, Collins had criticized her Republican colleagues for linking Obamacare with the government funding bill even as she called for the eventual repeal of the health care law. 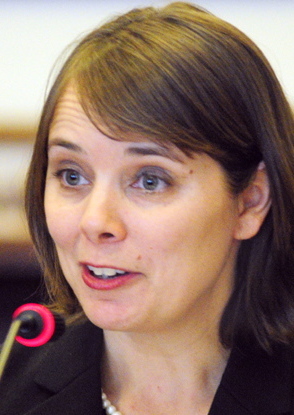 The fact that she resisted Democrats’ efforts to strip the Obamacare language from the House budget bill prompted Maine Democrats to accuse her of attempting to play both sides in the debate. 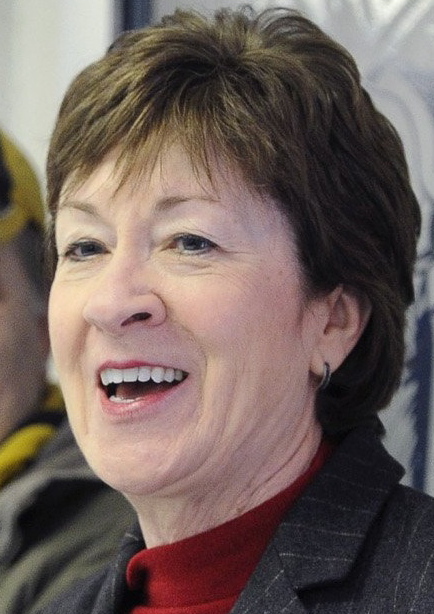 Collins went on to play a high-profile role in the subsequent effort to restart the government, though Bellows and Collins’ critics in Maine’s progressive circles have attempted to downplay her influence. Four days after the shutdown began, as Republicans and Democrats railed against each other in floor speeches, a visibly agitated Collins went to the Senate floor with a quickly drafted plan to fund the government. That plan was promptly dismissed by Democratic leaders. But Collins and a growing group of Republicans, Democrats and King – dubbed the “Commonsense Caucus” – continued working on a compromise. The final agreement that ended the shutdown was different from the group’s proposal. But Collins and other members of the group were called into numerous meetings with Republican and Democratic leaders as they finalized the deal. On Wednesday, the Collins camp played clips of floor speeches from eight senators who participated in those bipartisan negotiations, praising Collins for her work. “So the narrative that the Bellows campaign is putting out that somehow we are overstating this is very clearly refuted by her Democratic and Republican colleagues in the Senate who were actually there,” Dutson said. Asked about Collins’ role in attempting to broker a compromise, Bellows said politicians often take credit for fixing problems that they created. “If she had taken a more prominent leadership role from the very beginning, the shutdown wouldn’t have happened,” Bellows said.